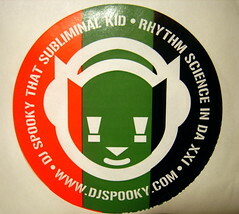 DJ Spooky is friggin’ brilliant, let it be said. He kicked off Rhythm Science, a lecture last night on art history, philosophy, hiphop and remix culture, by invoking the gift economy. He handed out free mix CDs to everyone in the audience. He then proceded to pull out a personal stash of records that are obviously the tools of his trade and shared them with everyone in the audience. Not for keeps, but show and tell like, letting everyone fondle and caress each piece of vinyl before passing it on to his and her neighbor. And then the lecture started. Here’s some notes I picked up along the way. And then there was the other reason he was here. This free lecture proceeds a $40 a head gig he’s doing this weekend at Yerba Buena in San Francisco. Spooky uses the 1915 silent KKK propaganda film The Birth of a Nation as source material for video on 3 giant screens and an accompanying composition he created. Too rich for my blood right now, but I’d love to hear report backs. UPDATE: Some pix I took. Steve Rhodes has more.